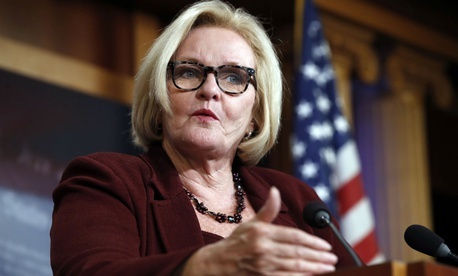 A Democratic senator on Monday reacted to a weekend expose on loosened enforcement against unlawful distributors of opioids by introducing a bill to repeal a 2016 law that trimmed the prosecutorial powers of the Drug Enforcement Administration. This weekend, The Washington Post and CBS News’ “60 Minutes” teamed up to report the results of an investigation that included interviews with departed and disgruntled DEA officials who suggested that the bill trimming their authorities was the fruit of lobbying by major distributors of the opioid painkillers that have caused thousands of cases of addiction and deaths. The reports also documented a “revolving door” of DEA officials who left for higher-paying jobs in industry. “At least 46 investigators, attorneys and supervisors from the DEA, including 32 directly from the division that regulates the drug industry, have been hired by the pharmaceutical industry since the scrutiny on distributors began,” CBS said. The bill, which passed both chambers by unanimous voice votes and was signed by President Obama, was sponsored by Rep. Tom Marino, R-Pa., President Trump’s nominee to run the White House Office of National Drug Control Policy, as well as Rep. Marsha Blackburn, R-Tenn. The legislation had been opposed by DEA and then-Attorney General Eric Holder, CBS reported. Trump on Monday was asked about the DEA story and Marino's nomination by reporters during a Rose Garden appearance with Senate Majority Leader Mitch McConnell, R-Ky.
"We’re going to look into that very closely,” the president said, calling Marino "a good man. I have not spoken to him, but I will speak to him and I will make that determination." If Marino's sponsorship of the bill clashes with the goal of reducing the opioid threat, “If it's 1 percent negative to doing what we want to do, I will make a change,” Trump said, He promised a major announcement next week on declaring an opioid crisis. Neither Marino nor Blackburn responded to Government Executive inquiries by publication time. Update: This story has been updated with comments from President Trump at the White House Monday.